Join ESA for the 9th edition of their Business Applications Annual Conference. 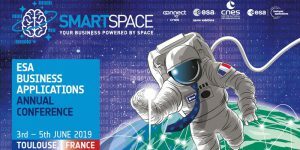 This year’s event is jointly hosted by ESA BICs and Innovation Partner Network, as well as CNES, in Toulouse (France) on 3rd – 5th June 2019. ESA is bringing together agencies, industry, users, experts, entrepreneurs and investors to foster partnerships and inspire new ideas. For the latest conference programme, please check their website. This event is open to residents from all ESA Member States. If you are from outside of one of these countries, please contact the organisers via email (space-applications-event@esa.int) for information as to whether you can register.